The BBC has expanded the reach of its incredibly popular online TV catchup service, BBC iPlayer, by creating a special version made specially for under-6s. 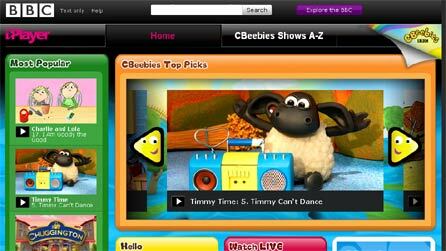 Though children’s content is readily available on the standard iPlayer, this version is not only more colourful and accessible for younger computer users, but will only show CBeebies content. This makes it much easier for parents to control what their children are viewing, particularly as it’s possible to add parental locks to various programmes. As per the main iPlayer, most shows are available to watch for a week after broadcast, with series being available to catchup on for up to 13 weeks. CBBC iPlayer, aimed at 6-12s, launched last year. There’s a new online destination where kids and parents can connect in their very own virtual kingdom. Kidlandia allows every child to be king or queen in their own fantasy kingdom with whimsical characters as companions, from horned Uniquills and scowling Grumps to long-trunked Yuhoos cavorting in Peppermint Meadows. The child’s unique fantasyland online becomes home decor as a wall art map that displays islands, cities, mountains, and other features named after family and friends. The map is a legacy gift that can be presented as a family heirloom to decorate a child’s room, or ordered as a canvas scroll for sharing on a play date or at family reunions. Kidlandia is the inspiration of Brian Backus, who started drawing the fascinating, illustrated characters that populate Kidlandia when he was just 4 years old, after being inspired by the stories of family neighbour Dr Seuss.